You see that kid in that picture? He's 12. He's going through a really great spell right now. His attitude is fantastic. He's ever helpful. When he is in a bad mood, he apologizes for it afterward. He does his work willingly and throws himself into everything with joy. We consistently get compliments on his behavior and manners from strangers. 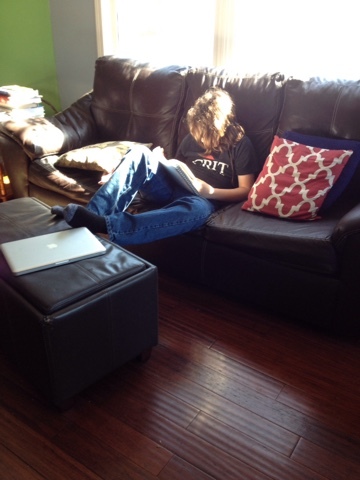 He is an absolute joy to parent and homeschool. Several months ago, everything was hard. Everything. Everything was hard for him. Everything was a struggle. He wrestled with his emotions. He wrestled with his reactions. He wrestled with every single thing. It was so hard for him. So, of course, it was hard for all of us. I remember being like that. I remember when every emotion I felt had to be analyzed and struggled with, even when the emotion was joy. Remembering doesn't make it easier for me to parent him. I think, in some ways, it makes it more difficult because I know what he's going through and empathize with him. I also have other children. One is 15, the other 18. Sometimes, they are a joy to parent. Other times, I want to curl up in a ball and cry. Sometimes, I do. If only I'd developed an app to track the number of hours I've spent balling my eyes out over my children, I could have been the big winner. It's hard to be a parent. When my children are depressed, it makes me depressed. When my children are happy, it makes me happy. I cannot completely separate my own emotions from theirs. When my chronically depressed child is struggling through depression, it feels as though our walls are drenched in tears dripping down the walls like wet paint applied too thickly. The darkness seems to close around all of us, keeping us from leading normal lives. But, especially me. It is hard to parent someone who is in the throws of depression. Sometimes, I get angry at him. And, while anger is a valid reaction, it is not the one that will help us. I need him to help himself, but that's not how depression works. So, I call my husband. He's my anchor in the middle of the emotion storm that rocks our house. He calms me, and listens. He holds me and understands. Moms, you don't have to go it alone. Reach out. Find an anchor. Look for the lighthouse. We, the human race, are all in this together. We can help you. Find someone who cares. Keep searching for that light. It will guide you safely to shore.